Old map by LEVASSEUR - Planisphère. N°93. Size: 11.4 x 16.1 inches. Condition: Very good condition. Steel engraved map in original out-line colours, the outer decoration is uncoloured, as issued. 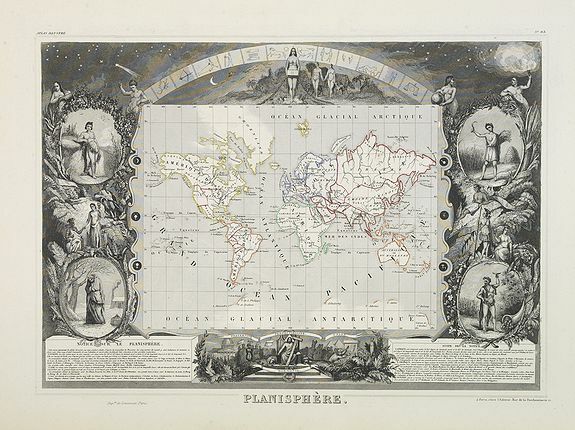 World map in Mercator's projection and surrounded by fine steel engravings including vignettes representing the four seasons, allegorical figures of the continents and several mythical figures, Adam and Eve and much else of interest. Lovely map from one of the last decorative atlases of the nineteenth century.